Short post tonight. Saw this article and I had to share it. 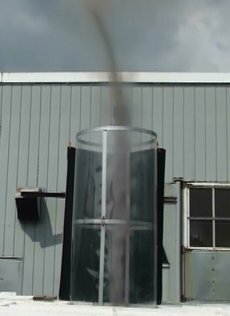 It’s from PopSci and it’s about Louis Michaud and his idea to produce energy with tornadoes. I love the idea, and no, that’s not the same as saying we should implement it ASAP. What I love is using the physics of weather to our advantage, just like in cloud seeding. I encourage you all to take a look at this article. One of Michaud’s AVE (Atmospheric Vortex Engine) prototypes.